Resurrection Letters will release in two parts, one out Feb. 9, the other out March 30! Michael W. Smith isn't the only singer/songwriter releasing two new studio albums early this year. 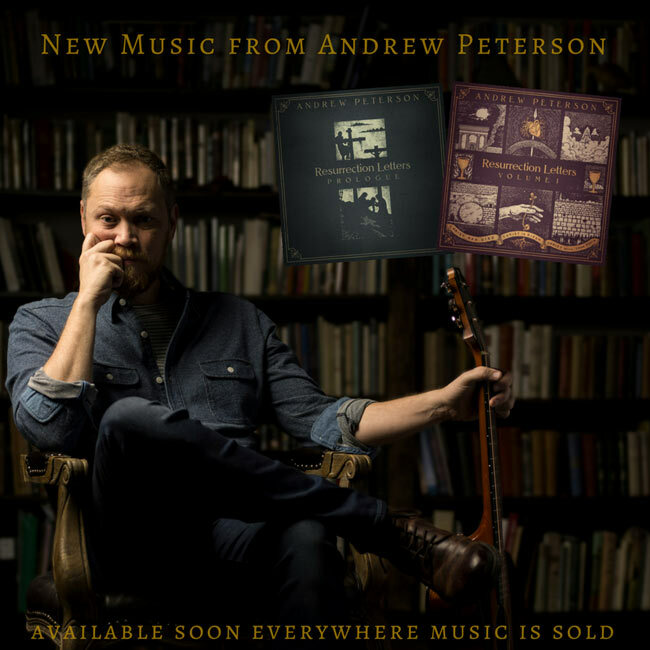 Andrew Peterson has just announced two projects as part of his Resurrection Letters that will release one each in February and March. Peterson writes, "After ten long years, I’m pleased to announce the upcoming release of TWO new albums: one for Lent and one for Easter. February 9 - Resurrection Letters: Prologue and March 30 - Resurrection Letters, Vol. 1." Here’s the deal, good people. Resurrection Letters, Vol. 1 is going to be released into the world just in time for Easter Sunday. The very first song, which you may remember from the Behold the Lamb tour, is called “His Heart Beats,” and is about that glorious moment in the tomb when Jesus, who was dead, came back to life. After that, every song was written to celebrate his resurrection and point to his return. In other words, this is meant to be a joyful album, one that you would turn up to eleven when you wake up on Easter morning, one that you would play on the way to church, and when you get home for an Easter feast with your friends and family—for that matter, one you’d play for the rest of Easter, which goes on for days and days. But when I was writing the songs it felt wrong somehow to pass over the darkness of the cross. So we wrote and recorded five songs about the death of Jesus, opening with his last words on the cross and ending with his body in the tomb. It’s called Resurrection Letters: Prologue, which makes it, to my nerdy glee, a prequel to the prequel! We wanted the release of these records to mirror the passage from Lent to Easter, which means dwelling on the darkness before the dawn. My hope is that these five songs would be waiting songs, Lenten songs, songs that remind you of the gravity of the crucifixion and pique your longing for the moment when morning breaks and Christ triumphs over the grave. These albums have been ten years in the making, and if you’ve hung with me this long I want to thank you for your patience and for the more or less constant inquiries about when this record would be made. You gave me the guts to knuckle down and do it, though to be honest I was still scared to death. Because I’m a Christian, and I believe the resurrection to be central to Christianity, I didn’t want to screw it up. Whether or not you’re moved by the songs isn’t any of my business, but I can say that I cried more joyful tears during this process than any other record—not because of the music (though I believe producer Ben Shive knocked it out of the park), but because the subject matter is so very good and beautiful and true. It’s my sincere hope that you’ll be moved to greater gratitude, greater awe, and greater love for our dear Lord after dwelling on these songs. He is risen, indeed." With the album announcement came a tour announcement. "Now Booking: Resurrection Letters Vol. 1 Album Release Tour. Andrew will be touring with a full band and opening act in support of the new release in April and May. If you are interested in finding out how to bring the tour to your community or church please reach out to 25 Artist Agency: 615-777-2227 or email them from the contact page at www.25ccm.com"